UK taxpayers could have gained "more money" from the privatisation of defence research firm Qinetiq, the National Audit Office (NAO) has said. While saying taxpayers could have gained "tens of millions" more, the NAO also condemned an incentive scheme that netted fortunes for Qinetiq's bosses. The government defended the sale and said it was excellent value for money. But Lord Moonie, the minister behind the original sale to a US buyout firm, said that he had tried to delay it. He was a defence minister in 2003 when a third of Qinetiq was sold to the US private equity group, Carlyle, for £42m. Stock markets had slumped and Lord Moonie felt that the Ministry of Defence (MOD) would not receive a decent price for its shareholding, said BBC business editor Robert Peston. But he was unable to resist Treasury pressure for the sale, Lord Moonie told the BBC. "We were reluctant to proceed with the sale, but a combination of the Treasury and the fact we needed the money for items in our budget persuaded us to go on with it," said Lord Moonie. 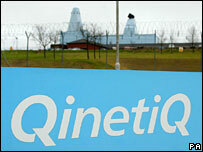 Carlyle's one third of Qinetiq grew in value to £372m, giving it a nine-fold return on its money. Qinetiq's 10 most senior managers gained £107.5m after the move, a return of 19,990% for their total £540,000 investment in shares, a return labelled "excessive" by the NAO. Qinetiq's two most senior executives, chairman Sir John Chisholm and chief executive Graham Love, made spectacular gains. Sir John invested £129,000 in the company and now has shares worth £23m. Graham Love turned £106,000 into £20m. Qinetiq's bosses were allowed to negotiate the terms of the incentive scheme with Carlyle while the private equity firm was bidding for the business, the NAO added. Conservative MP Edward Leigh, chairman of the Commons Public Accounts Committee, said the taxpayer had been "short-changed" and that top Qinetiq managers had "won the jackpot". The Liberal Democrats said the deal amounted to giving away "the family silver". Acting leader Vince Cable said: "It is completely unacceptable that the government has sold off a valuable national asset for a pittance, providing huge profits for the Carlyle group and the senior civil servants involved. "This deal didn't sell the family silver; it gave it away." But the Ministry of Defence has defended the deal. "It has delivered excellent value for money, generating more than £800m for the taxpayer, while protecting UK defence and security interests," said Baroness Taylor, Minister for Defence Equipment and Support. She added that she is constrained by what she is allowed to say ahead of a hearing by the Public Accounts Committee in December. Criticism of the deal will infuriate many business people, said the BBC's Peston. "Although they acknowledge that Carlyle secured the stake at a great price, they point out that the MoD kept more than half of Qinetiq," he said. "So the increase in value of Qinetiq as it moved into the private sector has actually generated very good returns for the taxpayer."